This story about Eugene Kaspersky complaining about Microsoft including antivirus software with Windows 10 touched a nerve. I had flashbacks to the litigation against Microsoft and Internet Explorer bundling in the late 1990s. Fast forward 16 years later from the browser showdown and we see that Internet Explorer is currently only the third most widely used browser in the market. That doesn’t sound like a monopoly to me. Could there be parallels to this story and a lesson for Kaspersky? What happens when like-products compete on value, ease of use, and reputation in the marketplace? There’s plenty of room for competition in anti-virus software market too. Will the best antivirus packages step forward? 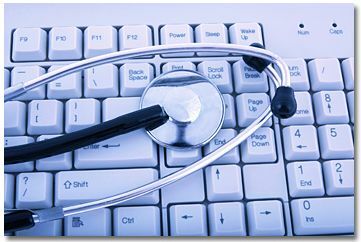 In my experience helping friends with personal computer issues at home, I found that most have the antivirus installed that was bundled with the computer. But typically the free trial subscription has expired. That’s certainly not a scientific study and my sample size doesn’t register as adequate. But I’m guessing many people are like that. Microsoft is helping consumers that are not tech savvy by providing automatic antivirus updates and a base level of protection. I see this as a good thing. There is opportunity for other competitors in this space. Just like the browsers in the late 1990s companies may have to rethink how they connect with customers. The topic of computer viruses is touchy and consumers are wary of a barrage of pop-ups asking for money and subscription renewals. So let competition find the real players. Build something better. Build something simple. Build something that adds value and builds a reputation of trust. Last week I started a two-post blog about examples of marketing communication letters to customers. I chose two examples that show when a marketing group is out-of-synch with the operations group of an organization. The letters are good case studies about syncing instructions, or the call-to-action, to a customer to provide a better customer experience. Last week was the Takata Airbag recall. 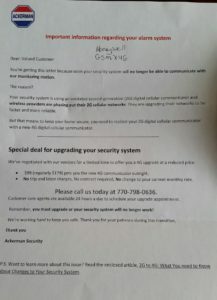 This week is about a letter I received from Ackerman Security Systems. I use Ackerman Security for my home security and monitoring system. I’ve been a customer for over six years and thankfully I’ve never had to use them in a real emergency. 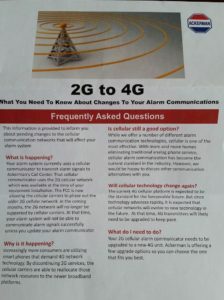 Several years ago, when we removed our home phone land-line, I switched to their wireless monitoring service. Fast forward a few years. One night our security panel made a noise we had never heard. It wasn’t an alarm signal, but it wasn’t normal. When I called for service, they told me my wireless unit had malfunctioned and needed to be replaced. When the technician came on-site he told me I also needed to upgrade from the 2G to the 4G receiver to be compatible with the new carrier systems. The upgrade was installed. 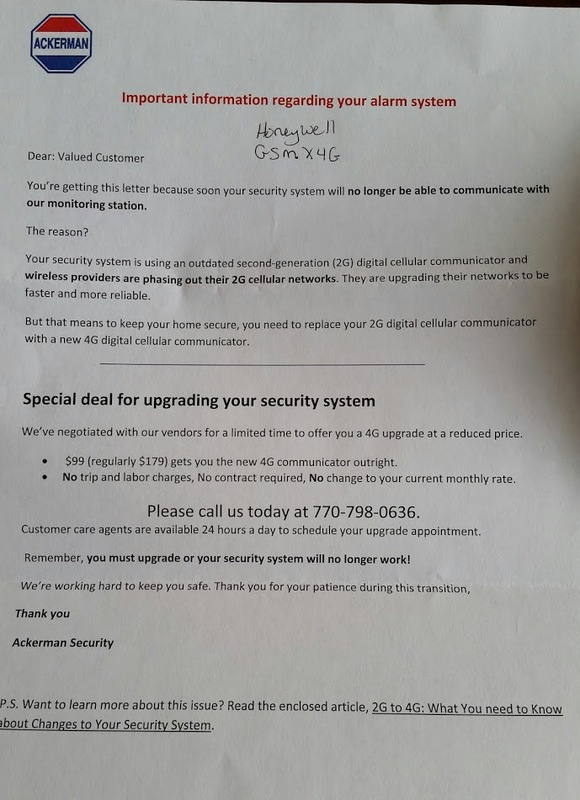 This month I received a letter from Ackerman telling me I must upgrade to the 4G digital cellular communicator because my existing model would soon no longer function on the carrier’s network. It’s a two-page form letter telling me I must buy the upgraded equipment to continue service. But I had already changed my device two years ago. Just to be sure, I took the cover off the central communicator unit to look for the model number. I found it labeled Honeywell GSMX4G. I searched online and found a few other complaints about this letter from Ackerman Customers. When I tried to call them to verify I listened to music for 20 minutes before hanging-up. I sent their customer service group an email letting them know I already had a 4G cellular communicator and to please update their records. No one acknowledged my email or contacted me after this. So what’s the lesson here? I am giving the company the benefit of the doubt this is not an intentional practice and they are not charging customers to upgrade to equipment they already have. I assume the real issue is they don’t have accurate records of the device installed at each customer location. If true, then my suggestion is to word the letter slightly differently with the understanding you “may need to upgrade your cellular communicator.” The letter could include some simple instructions about how to find the equipment type. As-is, this process leads to confusion and mistrust. In my next two blog posts, I’m taking a couple of businesses that I buy from to task. I received a letter in the mail from each business that did not properly describe what I should do as a consumer of the product/service. The letters are good case studies for marketing communication groups about syncing the instructions, or call-to-action, of a message with the operations of the business. This week is about a letter I received from the American Honda Motor Company. I will preface my Honda letter experience by saying that I’ve purchased multiple Honda vehicles in my lifetime. I am a repeat customer for Honda with no plans to change. 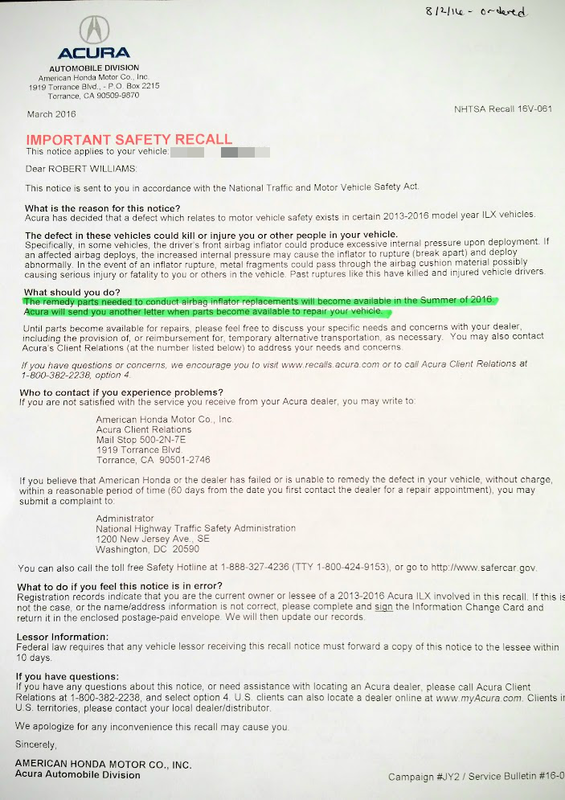 “Important Safety Recall” is in an enlarged point size that is all caps and red. – That caught my attention. I wanted to read the details. “What to do if feel this notice is in error” – This was good because I may no longer own the vehicle. They were sending this to the address of record for the vehicle VIN. They enclosed an update form and envelope in case their records were wrong. Information is included in the document about how to contact Honda if I have further questions or feel the resolution is inadequate. But the letter has a flaw. In bold letters it states “The defect in these vehicles could kill or injure you or other people in your vehicle”. When I read about the fatalities caused by this part defect I understood just how serious this issue is. Directly following is the instruction of what to do. It essentially says that I will be contacted with another letter when parts become available. I highlighted this statement and set it aside on my desk so that I wouldn’t forget about it. A few weeks later my daughter received the same letter for the Honda vehicle that she drives. The instructions were the same. Fast forward to early August. My daughter is getting ready to go back to college. I wanted to make sure this part replacement was completed prior to her departure so I decided to call a local dealer. What surprised me is the answer I received was “that part just went on back order but I can order you a new one and it will be here in a couple of days.” I called an Acura dealer about the other vehicle I own and received the same answer. I made appointments for both vehicles and had the recall part replaced. What if I hadn’t called? As I think about the problem, I understand there is a huge supply and demand situation to replace the airbags. The Takata airbag recall affects more than Hondas. I know the supplying plants are trying to keep up with demand for new vehicles while at the same time trying to make replacement parts for older vehicles. If Honda had told me to contact the dealer right-away it would have created chaos and a backlog of requests. When I read the history of events about this recall in the updates of that blog, I can see that auto makers are scrambling to cover their affected vehicles. Perhaps a better way to set expectations would be to have a schedule of availability based on production capacity, year/model/make, and location (high humidity zip codes first). Then provide the affected consumer with an estimated availability date. That approach may not have sat well with consumers in the back of the line, but it would have provided a better estimated time of replacement. The message of the existing letter is both open ended and for me didn’t accurately communicate when the parts were available. I spoke with a couple of friends who received a similar letter from a different manufacturer and they had the same experience. In fact, both of them were still waiting on the letters, months later, to confirm availability of the part. 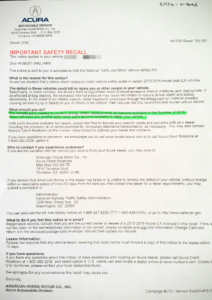 As it stands right now, you may want to call your local dealer if your vehicle is part of the recall. This week I received a useful email in what I call my Spam Hole inbox. It’s the second email account that I use for anything outside of personal correspondence. The message came from American Express. It stated that based on my past purchase history they knew that I had an upcoming trip planned. There was no need to call them to flag the account for travel because they had already noted it on file. The message was timely, because in years past I have called credit issuers to alert them about personal travel. This time, through a simple scanning program that searches for keywords about travel they could tell what I was about to do. It was convenience to me and saved a phone call or visit to my online profile to look for the setting. It’s better for them because it reduces labor to answer calls and provides them with consistency for how they flag card member travels. Is this an invasion of privacy? I more consider it a good use of technology. The card company already has my personal information when they reviewed it for credit. I think it’s great that they are proactively searching for ways to prevent fraud. Ultimately that means less hassle for me dealing with fraudulent purchases and better service from American Express. These days when we receive electronic messages like this our first thought is to not trust the email. 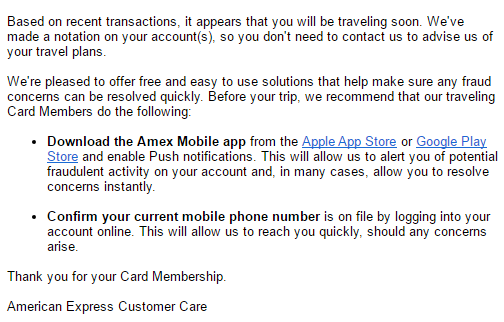 This communication from American Express was crafted in such a way that it reduced my concern for fraud. It was more informative and less action oriented. There was nothing in the email about clicking a link to change a password or to view important details in my account. There were no attachments. The email offered information about my account and also gave a couple of suggestions about communication paths they like to use with customers (app and mobile phone). So Kudos this week to American Express for proactively flagging my account for travel purchases and crafting an email that didn’t give me concern that it contained malware. Sometimes the simple things mean the most.